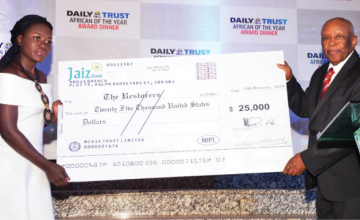 DAILY TRUST, a private newspaper in Nigeria, has opened the entries for nomination of outstanding personalities for the coveted "African of the Year" award, 2015. The award attracts a prize sum of US$50,000 given by UBA Plc, a leading pan-African commercial bank, in aid of charity projects chosen by the winner. In a statement at the weekend, the Associate Director of DAILY TRUST, Aliu Akoshile said ideal nominees should be ordinary Africans who have made extra-ordinary contributions to human development in any part of the continent this year. He said nominations can be made online at www.dailytrust.com.ng/award up until September 30, after which the winner will be selected by a seven-member Advisory Board/Prize Committee. Mr. Akoshile said the Committee, which was recently reconstituted, is chaired by Dr. Salim Ahmed Salim, former Prime Minister of Tanzania and ex-scribe of the Organization of African Unity (now African Union). Other members of the Committee who represent Africa's regional blocs are: Ambassador Mona Omar (North Africa), Mr. Amadou Mahtar Ba (West Africa), Ms. Gwen Lister (Southern Africa), Mr. Pascal Kambale (Central Africa), Professor Sylvia Tamale (East Africa) and representative of UBA Plc, the Co-sponsors of the award. The Chairman/CEO of DAILY TRUST, Mr. Kabiru Yusuf represents the award promoters. Now in its 7th edition, the African of the Year award was inaugurated in 2008 by DAILY TRUST in fulfillment of the newspaper's avowed commitment to promoting African unity and sustainable development across the continent. Five young women who developed an app to combat Female Genital Mutilation (FGM) have been awarded the 'African of the Year' award by Nigeria's Media Trust. The awardees - Stacy Owino, Purity Achieng, Ivy Akinyi, Synthia Otieno and Macrine Atieno, from Kisumu - who call themselves 'The Restorers' - were selected out of several dozen nominees. Their I-cut mobile application connects girls at risk of circumcision with rescue centres and provides access to legal and medical help to those who have been subjected to FGM. The subsequent awards have been won by the late Dr. Tajudeen Abdulraheem (2009), Mr Danny Jordan (2010), Judge Mrs. Fatimata Bazeye (2011), Mr. Thabo Mbeki (2012) and Dr. Donald Kaberuka (2013). The 2014 award was skipped owing to the prevalence of Ebola disease in parts of Africa. Some of the distinguished personalities who had served on the Prize Committee chaired by Dr. Salim are: Prof. Abdoulaye Bathily, Prof. Tandeka Nkiwane, Ms. Muthoni Wanyeki, Prof. Okello Oculi, Dr. Obadiah Mailafia, Prof. Kwame Karikari, and the late Dr. Tajudeen Abdulraheem.